Oh dear, if you're here, it's because you're having a problem with Stereo Lab! This page details Pspatial Audio's support policies and how to get in touch if you have a problem. Address any support mail to support@pspatialaudio.com. If the application has crashed, then we may send instructions for how to retrieve log information which will help us debug the problem. Before you log an issue, please review the features list to check that the audio input file is supported by your application version. For example, audio input files must always be stereo. Please also note that audio files are formatted and structured in different and inconsistent ways by different audio encoding and conversion tools. 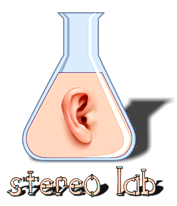 Stereo Lab always conforms to the official specification of each supported audio file format. We cannot absolutely guarantee that it will accept files which conflict with the official specifications; even when they play out successfully in your standard audio player. That said, we do aim to extend our support for "popular format inconsistencies" over time. When the Stereo Lab window is in focus on the desktop, the About dialogue is the first menu entry on the Stereo Lab (Version) tab on the main menu bar. To capture this dialogue, simultaneously press the Apple command key (⌘) + SHIFT + 4 as illustrated below. Pspatial Audio offer a two tier support model for Stereo Lab. The base level of support is defined by our Base Level Service Agreement (Base SLA). Technical support as defined in this SLA is included in the sale price of Stereo Lab. Subsequent support periods may be purchased by contacting Pspatial Audio Sales . For users requiring a consultation service and enhanced and accelerated support, we offer negotiated, annual support contracts as defined in a bespoke Service Level Agreement (SLA). Please contact Pspatial Audio Sales for details about an appropriate SLA for your business. 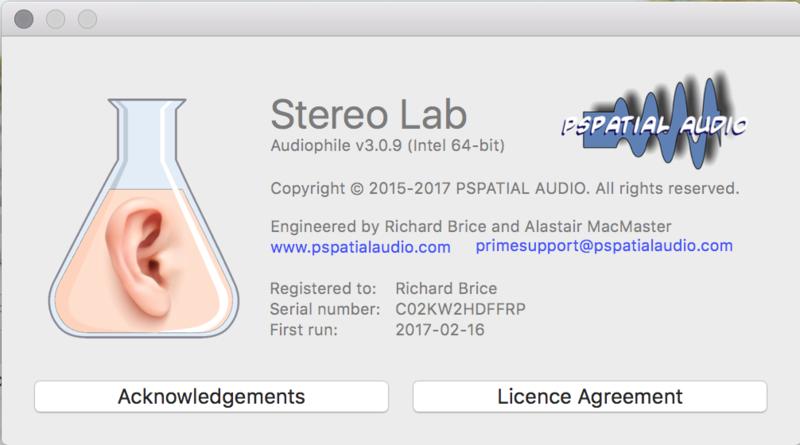 This Agreement represents a Service Level Agreement between PSPATIAL AUDIO (the Service Provider) and the person or legal entity who entered into the Stereo Lab Software End User Licence Agreement (the Customer) for the provisioning of services required to support and sustain the product known as Stereo Lab (the Product). This Agreement outlines the parameters of all IT services covered as they are mutually understood by the primary stakeholders, those stakeholders being the Service Provider and the Customer. This Agreement is valid from the date on which Stereo Lab Software End User Licence Agreement was entered into by the Customer and is valid for one year from that date. After that date, the Agreement is considered to have lapsed and any further support offered to the Customer by the Service Provider will simply be on a best efforts basis: a subsequent agreement being necessary to define IT service provision between the Service Provider and the Customer. Furthermore, the Customer's responsibilities include ensuring that the version is properly and legitimately licenced before contacting the Service Provider and for reviewing the program features list to check that the source file is supported by the installed version. Email support: Monitored 9:00 A.M. to 5:00 P.M. Monday to Friday: Emails received outside of office hours will be collected, however no action will be taken until the next working day.